I’ll Have Another scratched: The Kentucky Derby winner’s retirement confirms that the Triple Crown should be abolished. I’ll Have Another’s retirement from racing confirms it: Horse racing’s famous feat is anachronistic and impossible to achieve. Update, June 8, 2012: Today’s scratch and retirement of I’ll Have Another on account of a swollen left front tendon confirms my conviction that the Triple Crown has become a detriment to horse racing. The pursuit is too much, too soon for the modern 3-year-old. I’ll Have Another’s inflamed tendon makes him another Triple Crown casualty, along with Barbaro (who broke his leg in the Preakness two weeks after winning the Kentucky Derby) and Big Brown (who was found to have a crack in his hoof after the Preakness and finished ninth in the Belmont). If I’ll Have Another had been brought along more slowly, who knows how long his career might have lasted. He might have become an enduring champion, instead of ending his career as a one-month flash in the pan. Instead, we have a 12th consecutive Triple Crown tease. It’s getting old. I no longer expect a Triple Crown winner. When will other sports fans lose interest? Now NBC has to air the most anti-climactic Belmont Stakes in history, and Belmont Park has to promote a race that just became a lot less interesting. I won’t be betting on the Belmont, without I’ll Have Another inflating the odds on the rest of the field. It still may be a great race, but without the Triple Crown hype, it loses meaning. Triple Crown Productions—which lost Visa as the guarantor of its $5 million bonus after 2005—should find a new sponsor to fund a prize for a different series of races. For the sake of the sport—and of future 3-year-olds—I hope they do. It’s time to stop running the Triple Crown. The three-race series confirmed the greatness of War Admiral, Omaha, Citation, Secretariat, and seven other horses whose colors are displayed beside the Belmont Park finish line. But it’s become an impossible feat, an anachronistic embarrassment to horse racing, a challenge that exposes the weaknesses of the modern Thoroughbred rather than celebrating its strengths. Since 1979, 11 horses have won the Kentucky Derby and the Preakness. All 11 have lost the Belmont Stakes. On Saturday, I’ll be betting that I’ll Have Another becomes the 12th. Today’s horses are bred for speed, not endurance. They’re designed to win the six-furlong and one-mile races that make up the majority of racetrack cards. They’re not bred and trained for the classic distances—a mile-and-a-quarter in the United States (the length of the Kentucky Derby), a mile-and-a-half in Europe. The reason for this, arch handicapping nerd Andrew Beyer explains in the Washington Post, is that breeding is no longer dominated by the aristocratic families—the Vanderbilts, Whitneys, and Phippses. These pillars of the equestrian class had the money and the patience to develop horses that could fill the Big House with prestigious trophies. Nine of the 11 Triple Crown horses were owned by their breeders. The Woodward family’s Belair Stud breeding farm produced Omaha and Gallant Fox. The Wright family’s Calumet Farm raised Whirlaway and Citation. Now, most horses are bred for sale at auction. I’ll Have Another was sired at Three Chimneys Farm in Kentucky and purchased for $35,000 at Florida’s Ocala Breeder Sales. Given the realities of today’s Thoroughbred world, it’s time to either revamp this relic of racing’s Gilded Age or stop contesting it. To the ESPN-watching mook, the Triple Crown is the equivalent of the golf or tennis Grand Slam, the pinnacle of achievement in the sport. Every year a horse wins the Derby and the Preakness, Jay Leno reserves a seat for the Triple Crown-winning trainer. As a result, the only time I’ve ever seen horse racing mentioned on The Tonight Show was when the soon-to-be-fired Conan O’Brien joked about blowing NBC’s money by buying Derby winner Mine That Bird. Some of history’s greatest Thoroughbreds have raced in the last 34 years. But since only a Triple Crown will put a horse on the cover of Time, newsstand celebrity eluded Cigar, Zenyatta, Goldikova, and Tiznow. The Triple Crown, as presently constituted and marketed as racing’s greatest achievement, is preventing the best horses from getting the public acclaim they deserve. Another solution would be to change the Triple Crown to a series of races that aren’t restricted to horses of a certain age. The world’s fastest racehorses aren’t 3-year-olds, and yet the current Triple Crown is only open to these younger Thoroughbreds. My suggestion: an all-ages Triple Crown of the Dubai World Cup in March, the Whitney Handicap in August, and the Breeders Cup Classic in November. And if we want to make it really challenging, we could substitute the Arlington Million for the Whitney, so a horse would have to win on dirt and turf, just as Rafael Nadal has to compete on the French Open’s red clay and Wimbledon’s manicured lawns. This would not only extend interest in the Triple Crown throughout the year—it would extend it for multiple years. The Kentucky Derby, Preakness, and Belmont would still be significant, but as races preparing 3-year-olds for the big event. Since horses don’t mature until age 4, the competition would be deeper, and the pressure to win a Triple Crown wouldn’t ruin so many developing 2- and 3-year-olds. The Triple Crown is now good for one thing only: creating great betting opportunities for unsentimental wiseguys at the Belmont Stakes. Those 11 failures? Every one was the Belmont favorite. They’ve been sent off at average odds of 4-5, pounded below even money by racing romanticists who wanted a souvenir ticket on a Triple Crown winner. Some of my greatest memories as a horseplayer have come when betting on Belmont favorites to lose. In 2004, I noticed that Smarty Jones, at 1-5, was taking far more money to win than to place—that is, to finish first or second. Because everyone and their mother was betting on Smarty to win, you could actually make more money betting on Smarty to finish either first or second—a much safer bet. Any investor would love that situation. When I pointed this out to my friend The Stat Man, he bet $500 to place on Smarty Jones. I bet all the money in my pocket, which was less than $500. For the result, here’s Belmont announcer Tom Durkin, with a call whose emotional arc still makes my forearms tingle, even though I’ve watched the race more than a dozen times. Smarty Jones enters the stretch to the roar of 120,000, but Birdstone is gonna make him earn it today. The whip is out on Smarty Jones. It’s been 26 years! It’s just one furlong away! Birdstone is an upset threat. They’re coming down to the finish. Can Smarty Jones hold on? Here comes Birdstone. Birdstone surges past. Birdstone … wins … the … Belmont … Stakes. Smarty Jones paid $3.30 to place. He would have paid $2.70 to win. The Stat Man and I joyfully cashed our winning tickets. It was one of the most satisfying experiences of my gambling life. Meanwhile, in the press box at Belmont, a woman sitting beside Washington Post handicapper John Scheinman noticed he wasn’t all that deflated by Smarty Jones’ defeat. Scheinman had. Birdstone paid off at 36-1. Sarava, the horse who spoiled War Emblem’s Triple Crown, went off at 70-1. Da’Tara, winner of the race that Big Brown couldn’t finish, was 38-1. The only thing predictable about the third leg of the Triple Crown is that the favorite never wins. If you can’t make it to a race track or an off-track betting parlor to take advantage of this 12-times-in-a-lifetime opportunity, you can bet legally online at twinspires.com or xpressbet.com. If you want to bet, here’s my advice: Belmont is offering a Daily Double wager with the Belmont Stakes and the Brooklyn Handicap—a one-and-a-half mile race that’s being held on Friday. I recommend betting a few horses in the Brooklyn (Eye on Jacob and Redeemed look pretty good), along with every horse you think will survive all the way to the finish line of the Belmont. Although Andrew Beyer points out that you would have nearly doubled your money if you’d bet every Belmont horse in the last 15 years to win, the Daily Double offers a greater profit margin. 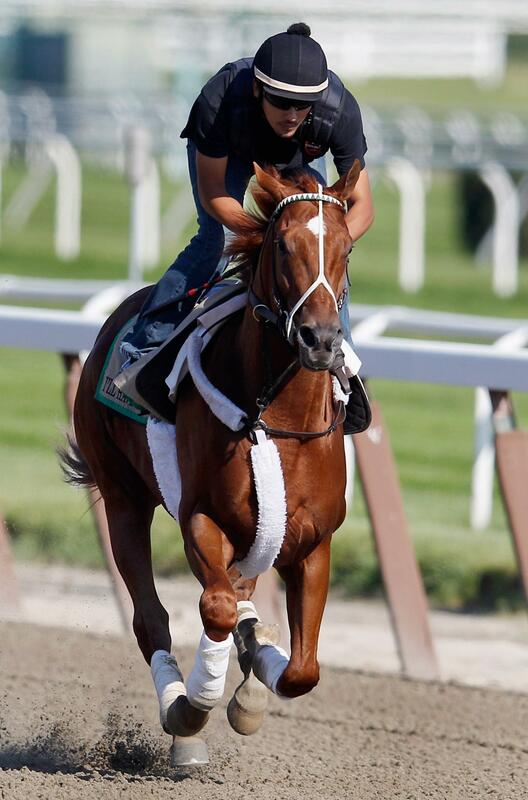 (Should my Brooklyn horses bomb out, I’ll bet Dullahan at the Belmont.) If I’ll Have Another goes off at 4-5, as the morning line and history predict, you’ll take a lot of money from people betting on a Triple Crown.